I have been sleeping with a CPAP for several months now and have notice somewhat of an improvement. I am obese now, but most of my life I have not been. I've recently been told that I have a low soft palate, so even when I lose the weight, I will still have sleep apnea. Yesterday I had an MRI of the brain and it showed a change in the white matter. I have no signs of MS, and I'm only 44 years old. Could having sleep apnea my whole life be causing this issue with my brain? If so, is there anything I can do to reverse these effects? Firstly, it would be interesting to know if you have depression. Clinical depression is often associated with brain changes, especially in patients obstructive sleep apnea. There are studies that evaluate gray matter, white matter and cerebrospinal fluid (CSF) volumes in the brains of obstructive sleep apnea patients. According to A. Kushida, editor of Pathophysiology, Comorbidities and Consequences of Obstructive Sleep Apnea, a small study of four severe apneics (with RDI=61.5) and four mild apneics (with RDI=8.5) in their late sixties, demonstrated that the severe group had significantly greater incidence of white matter hyperintensities than the mild group. Note: White matter hyperintensities predict an increased risk of stroke, dementia, and death. All the data indicate that at least in the older more severe obstructive sleep apnea patients, the presence of apnea episodes led to acute decreases in oxidative metabolism in white matter. 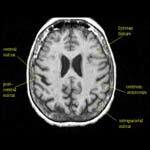 In other words...is like you said: sleep apnea affects the white matter of your brain. There are also articles on the internet where this problem is discussed. Click here to see the study results about the correlation between white matter lesion and memory impairment in patients with obstructive sleep apnea syndrome. Now, for your second question: "is there anything I can do to reverse these effects?" Fortunately, if you have an effective treatment with your CPAP, your brain changes will reverse to normal. Also, your depression will disappear. However, you need to have an effective therapy for your obstructive sleep apnea. You can read more about this situation here (you need to register to see the article). Losing weight will improve your breathing during sleep, even if you have a low soft palate. After one year of CPAP, check if you have improvements with CPAP with another sleep study. You need to measure your treatment evolution, to know where you are "now" compared to "yesterday". Make the adherence to your CPAP therapy a priority in your life. You have a chance to return to a healthy and normal life. This is my advice and I hope you are satisfied. If you have more questions, don't hesitate to ask. Thank you for responding. I don't currently have depression, but I had severe, debilitating depression almost ten years ago. I lost a whole year of my life to it. It was preceded by a series of panic attacks. I do have high blood pressure as well, although it is controlled with medication.